Cambridge Audio Minx Xi review | What Hi-Fi? Cambridge’s new Minx Xi is a terrific streaming system. It’s small, nicely made and, for the most part, well thought-out. All you need to add is a stable home network, a NAS full of music and a pair of quality speakers such as Q Acoustics’ Concept 20s to enjoy. Cambridge has been careful to keep the Minx Xi as inclusive as possible. 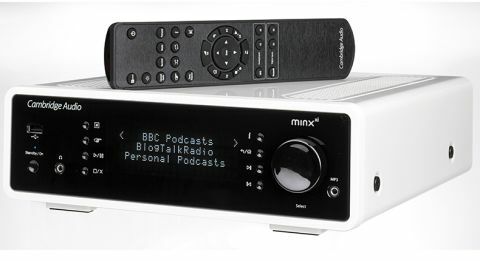 To that end it comes pre-loaded with streaming services such as BBC iPlayer Radio, Pandora and Rhapsody, and can connect to external sources wirelessly via aptX Bluetooth (using a supplied dongle). That Bluetooth ability means that music stored on phones, tablets and laptop can be played back easily. Should you prefer the wired option there are three USBs as well as optical and coaxial digital inputs. There’s also internet radio, with a claimed 20,000+ stations available from all over the world. Still have analogue sources? Don’t worry; the Minx Xi has two pairs of RCA inputs on the rear panel and another 3.5mm connection on the front. Getting started is easy. The Minx Xi can connect to your home network either wired (best for stability) or wirelessly with the aid of a supplied dedicated aerial dongle. Connection is swift and we’re up and running in minutes. The unit can be controlled in two ways; you can either use the conventional remote, which is nicely designed but makes accessing music from a NAS a little long-winded, or Cambridge’s free Stream Magic app. The app is available in both iOS and Android versions and is a fair effort, if a little unintuitive in use. The Minx Xi’s amplifier is rated at 40W per channel, but sounds stronger than that. It has plenty of drive and the ability to power a wide range of price compatible speakers with ease. We certainly had no issue with any of the options we tried, getting particularly good results from Wharfedale’s Diamond 121s and Q Acoustics’ Concept 20s. Another plus point is good file compatibility. The Minx replays the likes of FLAC, WAV and ALAC (Apple lossless) alongside AIFF, MP3 and AAC, and that’s pleasing. We start off by streaming music from our NAS and the results are impressive. Nina Simone’s version of Strange Fruit (a 16-bit/44.1kHz CD rip) is an emotionally charged affair, and the Cambridge doesn’t dilute it one iota. Simone’s vocal is touching and communicated with conviction. The instrumental backing is sparse – just a solo piano – yet it’s delivered with real power and no shortage of harmonic detail. Alongside that insightful nature there’s enough refinement here to keep things balanced and listenable. Move onto higher-resolution recordings – the Minx Xi’s resolution limit is 24-bit/96kHz files – and the good news continues. It displays plenty of finesse and composure with Kate Bush’s 50 Words For Snow (24-bit/96kHz) and fine rhythmic drive to make the most of The Rolling Stones’ Sympathy For The Devil. We tried the Cambridge’s digital inputs and found that the on-board DAC is a good one. It lacks a little tonal sweetness, but the results remain agile and articulate. There’s a strong sense of dynamics – both large and subtle – regardless of the digital input used. Switch to aptX Bluetooth and the sound takes a dip, just as we’d expect. But the important thing is that it stays entertaining and informative. While outright transparency suffers, the Minx Xi retains its likable character through this input, doing a good job of delivering Sibelius's Karelia Suite with authority. The music’s highly charged flow stays intact, though some of the low-level detail isn’t quite as easily heard as it could be. Still, it’s a fine performance with this relatively compromised connection. Try the analogue inputs and you’ll see that Cambridge hasn’t skimped here, either. The company’s impressive hi-fi pedigree is obvious in the balanced-yet-energetic presentation. Detail levels are high, and the results are as expressive and involving as we could expect from a system of this type. It’s certainly a more engaging listen than any similarly priced rival we can think of. We think Cambridge has done a terrific job with the Minx Xi. It’s easy to use, well built and sounds great. It would have been nice to play files of higher resolution than 24-bit/96KHz, but for us it certainly isn’t a deal breaker. If you’re the kind of person that has lusted after Naim’s excellent £1150 UnitiQute 2 but can’t afford the outlay, give this Cambridge a go. You won’t be disappointed.